Yesterday while putting down the last of the tatami and doing a general tidy of the Brandywines, I noticed some of the popcorn looked to be ready for harvest. Sure enough, a closer inspection of one of the smaller varieties I planted this year - Tom Thumb - showed it was indeed ready to be set to dry. Dried husks and a plant looking about as done with the heat as me were the signals I needed to take a peek. These little guys measure perhaps four or five centimeters total and come from plants that perhaps reach just over my knees. A cute little variety that might just be perfect for container growing if one loves popcorn but has only a balcony or veranda, the fat kernels from Tom Thumb provide good flavor, too. Laid out with the akashiso at the moment they should be dry in a couple weeks. How cute! We tried growing popcorn in our large garden in E. Texas, but the squirrels got every single ear. If I grew this smaller variety in large pots on the patio, I'd have a much better chance of actually getting some popcorn! That is so cool that you grow popcorn (which makes sense with your blog title). 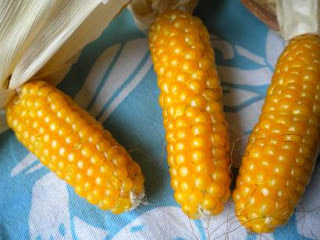 I never knew there were specific varieties of corn esp for popcorn, and now I want to grow some at my apartment. If you have a post that talks more about this, let me know. And if not, you should write one! Thanks, Katy and Ladymoxie! I'm so glad you two enjoyed the post. The smaller varieties are quite easy and entertaining to grow. I think it's a brilliant idea to do a post about them. Double thanks!